On 15 August, accompanied by other representatives, the Executive Director and President of China Power Tian Jun visited Dabieshan Power Company for site investigation and inspection. 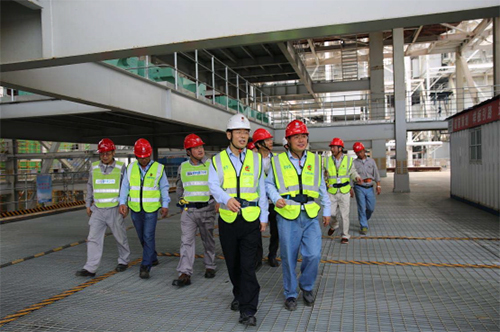 Tian Jun and others visited the Phase II construction site and Phase I production plant, gaining thorough understanding of construction safety, quality management, production and operation, and equipment management. 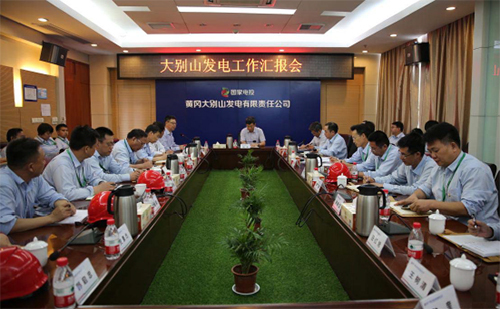 At the meeting, Tian Jun was briefed on the Phase I production and operation, Phase II construction, and Party building of Dabieshan Power Company. He highly recognised the achievements Dabieshan Power Company has made and its unique management skills. Yet, he pointed out that there was still room for improvement in areas of construction, equipment maintenance, and fuel management. Tian Jun set five requirements for the next phase of work: first, the company shall apply risk management and control in every aspect of corporate management and establish a production safety accountability system for all employees; second, the company shall resolve key and difficult issues in a timely manner and step up the effort to advance the Phase II construction; third, with a focus on details, the company shall strive to improve production and operation management in order to achieve better performance; fourth, the company shall seize opportunities to implement the procurement strategy, control fuel costs, and identify other ways to procure coals for Phase II facility set in advance. The heads of the fuel department and construction department set specific requirements for fuel management and construction management. The leaders of Dabieshan Power Company also participated in the investigation and inspection.